This filter takes input from an image clip and converts this into a water-color stylized animation. Temporal Smoothing Pop-up: Used to enable the smoothing of the filter result over time. Off – Function is disabled. On – Function is enabled. Lines Only – Temporal Smoothing is applied only to the lines and not the composited background. Boost Contrast: Increases the overall contrast of the filter result. Higher values increase contrast. Cartoon On Checkbox: Used to enable or disable the cartoon / contouring effect. Cartoon Mix: Blends the cartoon / contour result with the image. Cartoon Levels: Used to control the amount of image contouring. Lower values generate fewer contours. Lines On Checkbox: Used to control whether lines are drawn around the contour / cartoon regions. Paint Mix: Used to blend the watercolor paint. High values generate a watercolor paint look, low values generate a more cartoon style look. White Boost: Pushes the pixel values in the image toward white. Higher values bring more white into the image. Only Background: If this is checked the posterize is applied to the background image, and does not affect the generation of lines. The lines are based on the smoothed, but not posterized, image. Leaving this off tends to generate more distinct lines that follow the edges generated by the posterization. 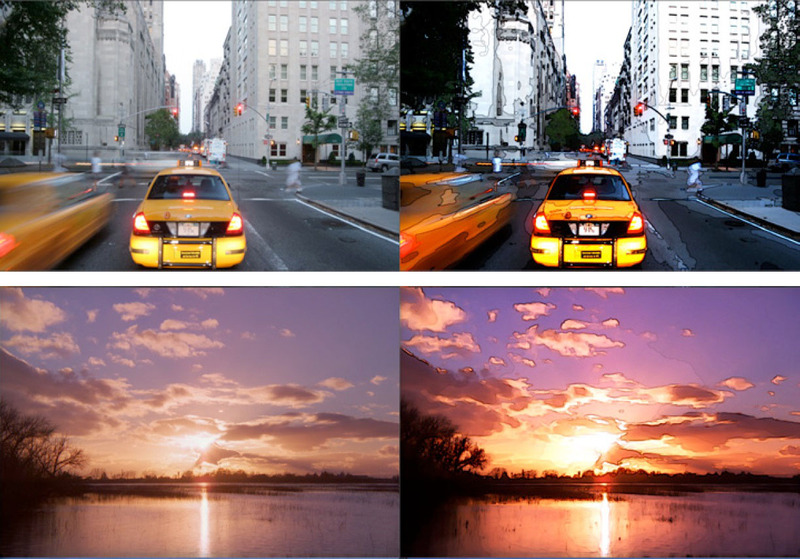 Minimum Mix – Blends the contoured image result with the protected image result. Matte Threshold – Used to determine the pixel values in the image that are included in the protection matte. Expand Matte – Spreads the Matte outwards. Harden Matte – Hardens the Matte edges. Softer Cartoon Checkbox – Softens the image contouring. Thicken – Makes the lines thicker. Blur – Applies a blur filter to the lines. Median – Applies a median filter to the lines. Contract/Expand – Contracts or expands the width of the lines. Invert Lines Checkbox – Inverts the generated lines. When disabled (default position) the result is solid colored lines over the background image. When enabled the result is a solid color background over image colored lines. Line Color – Used to set the line color. Opacity – Used to set the line opacity.